Far Cry 3 is a very good game. So good that, even after beating the main story, all of the radio towers and a good percentage of the outposts, I've started a new game and am still playing. All these hours later, one thing still grates: No matter what you do, you can't turn off the game's screen-cluttering UI training wheels. Thankfully, if you're playing on PC, now you can. Yesterday, a .dll file tweak made the rounds that allows you to do remove all HUD elements from the game—with a simple .dll tweak in a HEX editor, every single one of the game's UI pop-ups, from the mission reminders to the minimap, vanishes. DX9/10: Locate and backup \bin\FC3.DLL, then open the original file with a HEX editor, I'm using Hex Workshop. DX11: Locate and backup \bin\FC3_d3d11.dll, then open the original file with HEX editor. In the next few lines you will see S.h.o.w.U.I.E.l.e.m.e.n.t. Replace the S.h.o.w.U.I.E.l.e.m.e.n.t. with H.i.d.e.U.I.E.l.e.m.e.n.t. The Reddit post also has a way to remove the various "accent" sound effects the game makes to go along with the HUD, but I actually don't mind those, so I left them in. I've been playing the game with no HUD for the past day to see how it works, since I didn't want to just recommend doing this if it messes up the game. Fortunately, this tweak works perfectly, causes no stability problems, and really does make Far Cry 3 feel different. One Caveat: The only problem I've come across with this tweak is that on some story missions, you'll be required to do quicktime events, and the prompts no longer show up on-screen. I got attacked underwater by a pirate on a mission, and was unable to guess my way to victory. I had to quit the game, go to my backed up original .dll, and fire it back up. The bummer was that the QTE happened near the end of the mission, and thanks to Far Cry 3's stupid save system, I had to play the whole thing over again. If you're going to implement this hack, keep a backup of your original .dll file easily accessible (you're doing that anyway, right?). Then, going back to the UI is a matter of a quick copy/paste. Alternatively, you could go check out a let's play video and find the QTE in question, I suppose, if you've already played the game and don't mind seeing it again. I wouldn't recommend this for people going through for the first time: You'll have to be pretty familiar with the button prompts, your weapon-wheel is gone, and you won't get contextual cues to do takedowns and the like. (Though if you are playing for the first time, I've got some beginner's tips for you, as well.) But if you're a seasoned player, taking off the training wheels is just the thing. 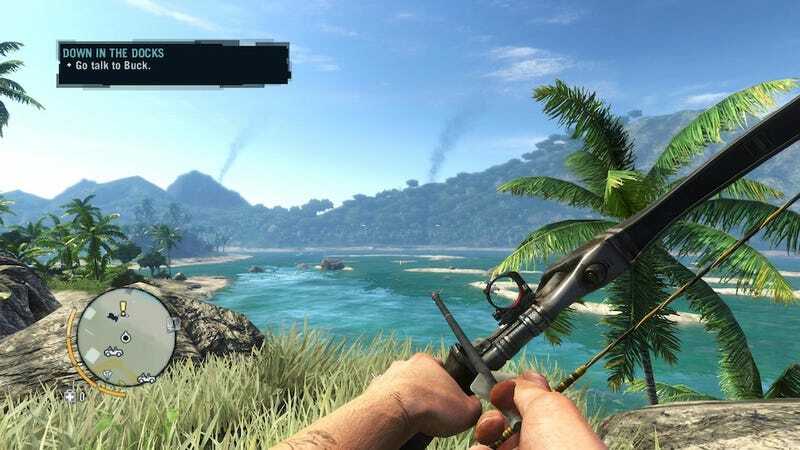 Like any good open-world game, Far Cry 3 is built around redundancy. You don't need to see enemies on the mini-map, because you can tag them with your camera. And you don't even need tags, because if you use your ears, you can hear them. Or, you can finally use those combat syringes you crafted but never wound up using. You don't need a waypoint to tell you where an outpost is, because outposts all spout columns of smoke that can be seen for miles. You don't need to mark radio towers on your map because radio towers are… well, radio towers. They're pretty visible. Want to know where to go next? Do what you'd do in real life: Make for higher ground and look. Other things to try: Dial up the difficulty to hard. Experiment with your weapon loadout (No sniper rifle? Pistols only? Fire weapons only?). Turn off the music, turn off enemy tagging. Suddenly, it'll be like you're playing a whole new game. Or at least, a very different one. I'm being glib with the "best" thing, of course—there's no one "best" way to play a game. This mod is something of a scorched-earth approach, but until more mods surface or Ubi patches the game, it's an interesting and fun way to go. There are some other early mods and patches floating around, notably some patches that remove elements from the minimap, but I haven't tried them, so I don't know if they work or not. If you've used any other tweaks, I hope you'll share your experience in the comments. There's some concern on Reddit and elsewhere that tweaking your .dll will get you banned from Uplay. I haven't been able to turn up any evidence of this happening to anyone (and it hasn't happened to me), but I've sent a note off to Ubisoft to ask if this kind of thing can get people in trouble. I'll update if I hear back.